In August 2018, the Honey Bee Health Coalition (Coalition) and the Entomological Society of America’s Plant-Insect Ecosystems (ESA P-IE) Section co-hosted a three-day field tour in North Dakota to showcase the Bee Integrated Demonstration Project and its partners along with other collaborative efforts to study, develop, and promote solutions impacting pollinator health. 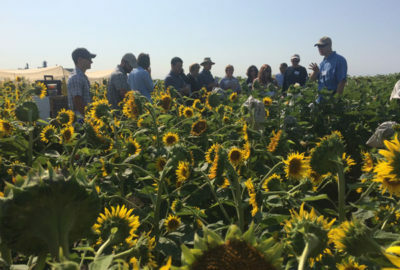 This summer’s tour called “Collaborative Approaches for Pollinator Protection and Productive Agriculture,” was built on the success of a 2017 pollinator-focused field tour organized by ESA P-IE. This year’s tour brought together roughly 50 people from 16 states and Canada. Participants included beekeepers, farmers, researchers, apiculturists, regulators, students, and representatives of beekeeping and commodity crop associations, chemical agriculture corporations, seed companies, conversation nonprofits, research agencies, and universities. North Dakota was chosen because it is the top honey-producing state and the epicenter of the beekeeping industry in the summer. Plus, 90 percent of the state’s land is used for agriculture, mostly in the form of commodity crops. The tour began in Bismarck on August 13 with presentations from state agriculture officials about the commodity crop and beekeeping industries in North Dakota. State apiary inspector Samantha Brunner spoke about intense competition for resources as suitable honey bee forage in the state has halved in the last 20 years while the number of honey bee colonies has more than doubled and continues to rise. This has negatively impacted both honey bee and native pollinator populations. Brunner also shared an online map that allows pesticide applicators to input when they plan to spray and automatically notifies nearby registered beekeepers. While some sprays have proceeded unchanged, she said, the tool has made it easier for conscientious applicators to coordinate with beekeepers. “Those doors of communication have been blown wide open,” she said. Also that evening, North Dakota State University (NDSU) professor and extension entomologist Janet Knodel presented on insect pests in North Dakota crops. Over the next two days, participants visited a U.S. Geological Survey research center, explored Bee and Butterfly Habitat Fund forage plantings, heard about how the Bee Informed Partnership helps beekeepers use the Coalition’s Tools for Varroa Management Guide, learned about the North Dakota Pollinator Plan, and toured a commercial honey processing plant. The tour’s final stop was a research site shared by NDSU and USDA Agricultural Research Service scientists who investigate sunflower pollination and other managed and wild bees. 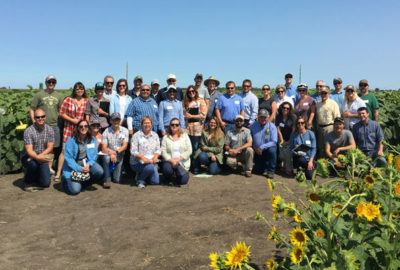 The tour highlighted the Coalition’s Bee Integrated Demonstration Project, which pairs farmers and beekeepers, helps them implement best practices, and encourages them to communicate and coordinate efforts to promote pollinator health. Many of the Coalition-member organizations on the tour have helped implement or fund the Bee Integrated Demonstration Project since its start in the spring of 2017. Several tour stops featured the project’s partners and practices, including those related to forage, varroa mite control, crop protection, and beekeeper-farmer collaboration. Tour participants visited two farms where the landowner had set aside area to plant forage designed specifically for honey bees, monarch butterflies, and other pollinators; the forage also provides benefits to a broader range of wildlife species. In each case, landowner and the beekeeper using the land also had increased their communication and gained a better understanding of their challenges and shared goals. One of those sites participates in the Bee Integrated Demonstration Project. Landowner Harold Schulz, who partnered with beekeeper Randy Verhoek for the project, said he grew up in the 1930s and ’40s on the farm he showed participants. “I didn’t realize what kind of trouble the bees were in,” he said. He was happy to help the bees and thrilled that other animals, including white tail deer and pheasants, have also been using the 10 acres of pollinator habitat he planted on his 220-acre property. He plans to maintain the pollinator acreage indefinitely. One participant captured the group sentiment around seeing the Bee Integrated Demonstration Project in action when he said the Schulz Farm stop was a culminating experience and that now the goal was to build interest in the project’s ideas and replicate its success. On the tour’s final day, commercial beekeeper Zac Browning praised the efforts of the landowner and the farmer who had maintained pollinator forage around his apiary. “They’ve recognized that this here was not the best farmland, but it has the potential to be terrific land for bees and pollinators and even for water and soil health,” Browning said. He added that communication has helped farmers and beekeepers find common ground and work toward solutions. “They’re trying to protect their livelihood, and we’re trying to protect ours, and, in situations like that, communication is all we have. When there’s relationships then we’ve got a fighting chance,” he said. Most participants traveled roughly 250 miles together on a bus and were able to network and share insights between Bismarck and Fargo. Another participant, Chad Boeckman, a research scientist at Corteva Agriscience, wrote, “I was struck by the factors that ultimately drive landowners to take action, despite those landowners having a great respect and appreciation for conservation.” He said he would love for tour participants, as well as partner organizations working on pollinator health, to explore these factors (summarized in key takeaways, below) in more depth and find ways to make it easier for landowners to take action that benefits pollinators. The value of habitat: Participants noted the impact of seeing and hearing about pollinator habitat loss as well as seeing examples of pollinator forage and habitat in the field. Speakers emphasized dramatic landscape changes over the last 20 to 30 years that have reduced forage for pollinators through changes in agricultural and other land use. 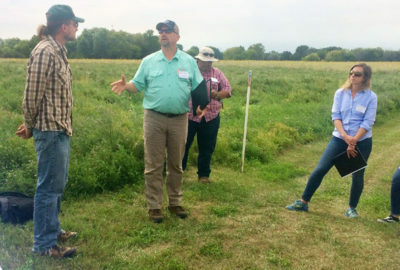 Participants also experienced firsthand various examples of pollinator forage and habitat in the field, observing the variety of flowering plants visited by managed and native bees as well examples of various forage management strategies. Farmer motivations to plant habitat: The tour highlighted that personal outreach, an interest in wildlife and/or pollinator conservation, opportunities to use marginal farmland for other purposes, and access to seed and technical assistance all help contribute to landowners’ interest in and ability to plant habitat. Tour participants were interested in further exploring these and other factors that attract landowners to habitat and pollinator forage programs and make it easier for landowners to participate. Commercial beekeeping challenges: Speakers and tour participants highlighted challenges facing commercial beekeepers including: Reduced habitat and forage; Increased resource competition as beekeepers have concentrated in geographic areas, especially in North Dakota; Increased difficulties managing and treating varroa mite infestations; Increased economic pressure to provide pollination services that involve stressors such as long-distance travel and exposure to other colonies, which increases the risk of the spread of pests and diseases. Collaboration: Participants were thrilled to physically see the results of long-term partnerships and emphasized the need to encourage and incentivize farmer-beekeeper communication and coordination, continue to grow and develop relationships and partnerships, promote collaborative models and replicate their successes, and find more opportunities to close gaps between people and organizations working on different aspects of the same pollinator health issues. Inspiration: The tour was a source of hope and positivity for many. Participants said they were inspired and uplifted by the positive impacts of collaboration and communication; interest in honey bees and healthy productive ecosystems; practices intended to help pollinators that also benefit water and soil quality, ecosystem diversity, and other environmental goals; and land stewardship and care for bees, plants, and wildlife. Understanding: Participants said experiential learning helped increase their knowledge and understanding of the impact of agriculture, beekeeping, and environmental stewardship practices in North Dakota on the rest of the country and the world; innovations and ground-breaking efforts in North Dakota; research implications for practical and industrial applications; changing land uses and habitat impacts; and incentives and barriers to change practices for farmers, landowners and beekeepers. Among four sections within the Entomological Society of America, the Plant-Insect Ecosystems (P-IE) section is the largest, constituting roughly 39 percent of ESA members, and includes entomologist working on crop protection, host plant resistance, plant pathology and vectors, biological control, and pollinators. The P-IE section established a Pollinator Initiative in 2015 with the goal of providing technical educational materials to members and to leverage this knowledge to the public, media, policymakers, and other key stakeholders. The ultimate goal is for P-IE to become a lead national expert organization for the dissemination of such knowledge by the end of the decade. To help achieve this goal, the P-IE section sponsored a 2017 field tour in Mississippi about pollinator health and integrated pest management, and the 2018 field tour builds on the previous tour’s success. The Honey Bee Health Coalition is facilitated by Keystone Policy Center and brings together beekeepers, growers, researchers, government agencies, agribusinesses, conservation groups, manufacturers and brands, and other key partners to improve the health of honey bees and other pollinators. Its mission is to collaboratively implement solutions that will help to achieve a healthy population of honey bees while also supporting healthy populations of native and managed pollinators in the context of productive agricultural systems and thriving ecosystems. The Coalition is focusing on accelerating collective impact to improve honey bee health in four key areas: forage and nutrition, hive management, crop pest management, and communications, outreach, and education.